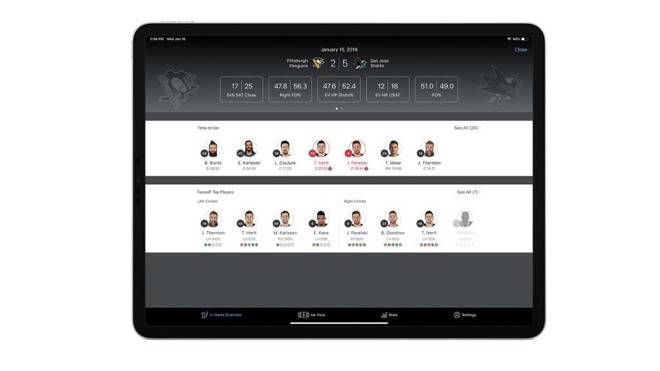 The NHL is aiming to provide coaches more information about how the team is faring during games, by issuing iPads running a new insights app on benches that offer more than 60 different real-time individual and team statistics to team management. 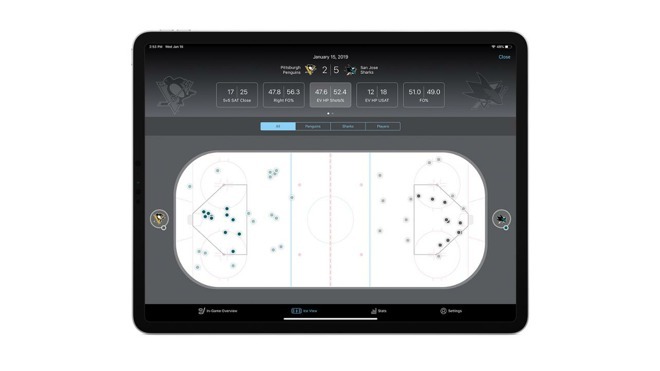 Produced just for use by coaches, the SAP/NHL Coaching Insights app will give real-time information managed and stored by the league, such as player's time on the ice, face-offs, zone-based success rates, success against specific players, and other useful data. Coaches can manage how the data is shown, as well as set thresholds certain statistics, such as for timing how long a particular player has been on the ice. Some data is said by the NHL to be handier in a "deep dive," offering up shot attempts, unblocked shot attempts, chances for and against, and the success rate on shootouts with forehanded shots and backhanded shots. Color coding is also heavily used, to allow coaches to quickly understand the data at a glance without needing to read the figures. "There's a lot of information out there, but coaches are still writing it down on pieces of paper," said NHL SVP of business development and innovation David Lehanski. "They're not using it the way that they could use it because there really hasn't been a platform that will allow them to do it easily and efficiently and to quickly customize it to see what they want to see." Lehanski continued insisting "We're also doing it because we're setting a foundation so that when puck and player tracking is fully live, now we've got the video, the stats and analytics app, and we can start pouring in the data to mesh with it so we have a true real-time system." The app will be provided on iPads positioned on the bench during games, and will serve as a complement to the three existing iPads that provide real-time video to coaches. The NHL expects to debut the app league-wide after the All-Star break, but has yet to set a rollout date. Online training courses will also be provided along with manual handbooks to coaches to teach them how to use the new system.